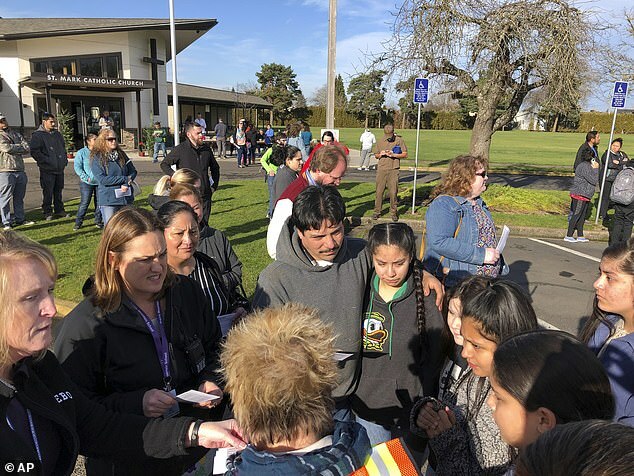 Charles Landeros, 30, was fatally shot in the head by Officer Steve Timm at the entrance to Cascade Middle School in Eugene, Oregon on January 11. 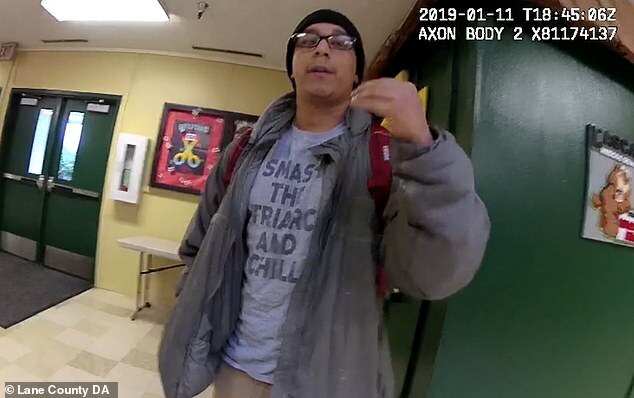 Video footage recorded by Timm's body cam shows Landeros in the hallway near the entrance inside the building at around 10:30am. 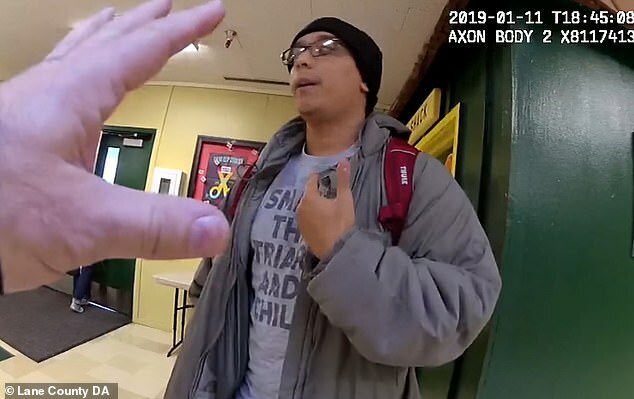 Landeros, who was reported to be involved in a custody dispute over a young girl who attends the school, then sees his daughter coming down the hallway. At this point, the two officers, Timm and Aaron Johns, lead Landeros toward the exit in front of the school. The officers inform Landeros that he is under arrest. They then push Landeros up against the wall while trying to take him into custody. Just a few moments later, Landeros pulls out a 9mm handgun and fired twice in Timm’s direction, according to The Register-Guard. Johns and Landeros were wrestling each other on the ground when Timm, who was not hurt, fired the fatal shot that killed Landeros. 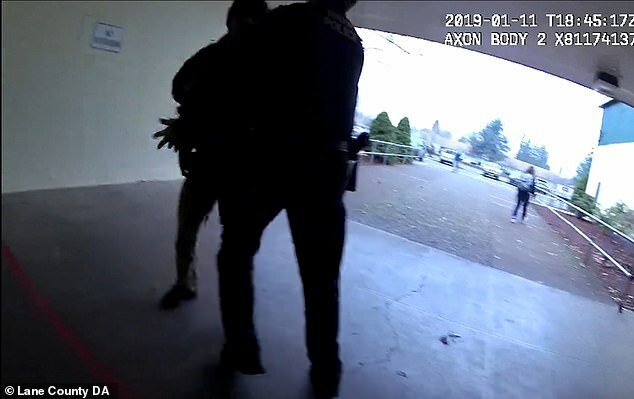 On Thursday, the Lane County District Attorney, Patty Perlow, said that the officers acted properly and that the use of force was justified. 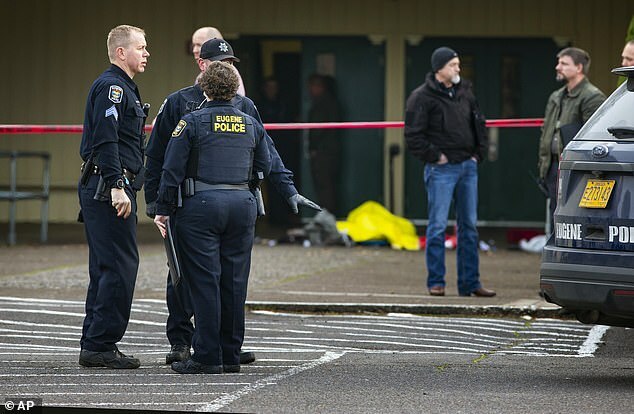 There was ‘no clearer circumstance that the use of deadly force is justified than this,’ Perlow said. 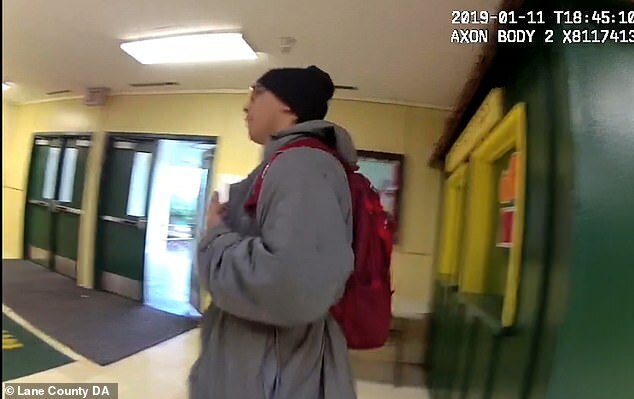 The District Attorney also said that the officer acted appropriately in removing Landeros from the school. She said there was probably cause to arrest Landeros for disorderly conduct and trespass. 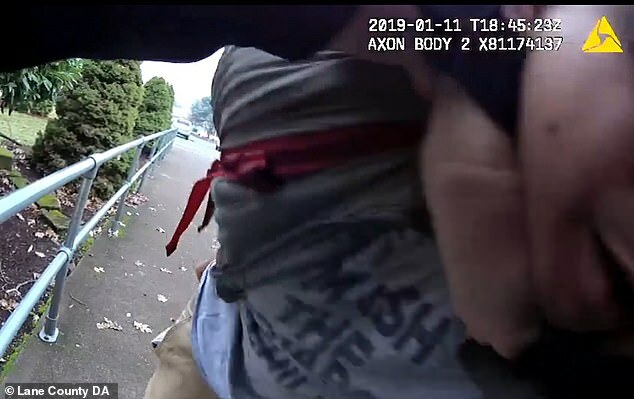 ‘Upon making the arrest, their lives, and the lives of others, were placed in danger by Mr. Landeros physically resisting that arrest, brandishing a firearm and firing it twice,’ Perlow said. 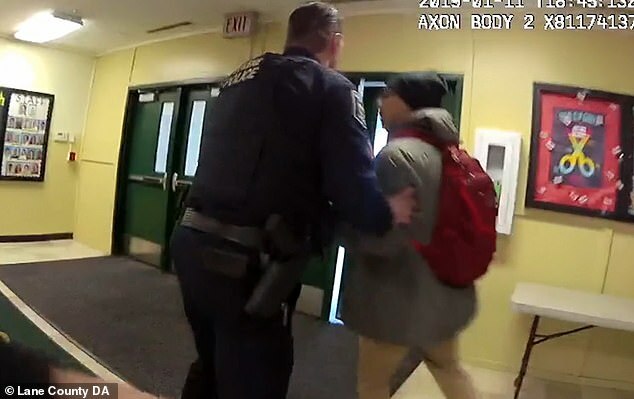 ‘It is unknown why Charles Landeros chose to use deadly force in this circumstance, but he clearly had no regard for the lives of the police officers or the students or staff present, including his child. 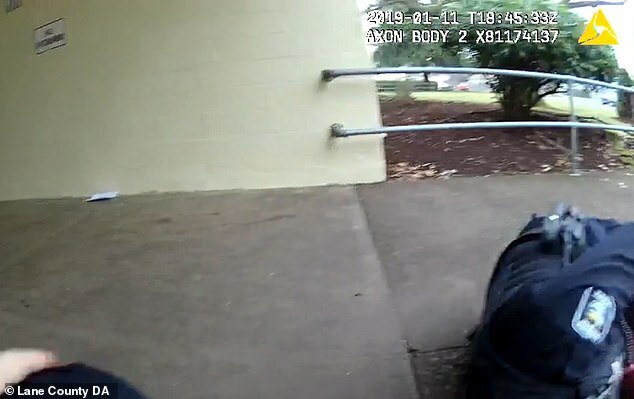 ‘Officer Timm saved the life of Officer Johns, himself and perhaps many others given the number of rounds Charles Landeros had loaded in his weapon. Perlow said that the magazine in Landeros’ handgun was fitted with a device that expanded its capacity from 18 rounds to 20 rounds - not including the chambered round. The District Attorney said that Landeros had another magazine attached to a gun belt that he was wearing. Landeros also had on a backpack with more ammunition of a different caliber, Perlow said. The District Attorney said that the struggle and the shootings all took place in full view of his daughter. Landeros’ mother, brother, and partner have hired a civil liberties lawyer. Landeros identified by the non-gender-specific pronouns they/their/them. He was divorced from his ex-wife, Shayla, with whom he shared custody of their two daughters. 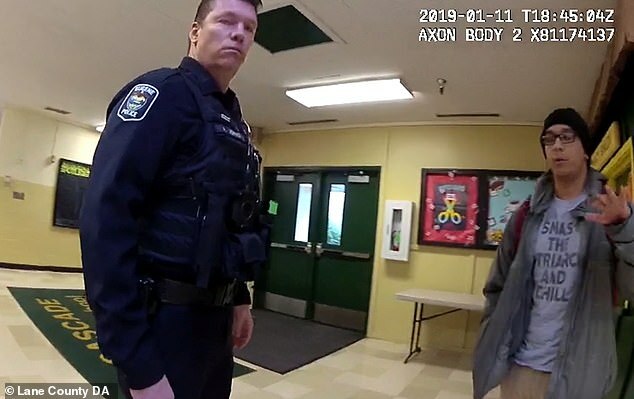 According to Perlow, Landeros enrolled one of the daughters in Cascade Middle School several days before the incident - without informing his ex-wife. When Landeros’ ex-wife found out about it, she brought custody paperwork to the school. The school then called Timm, the school resource officer. It is standard practice in the district to call in law enforcement whenever there is a custody dispute. The school also called Landeros. Timm then called Johns, who is also a school resource officer, for assistance. 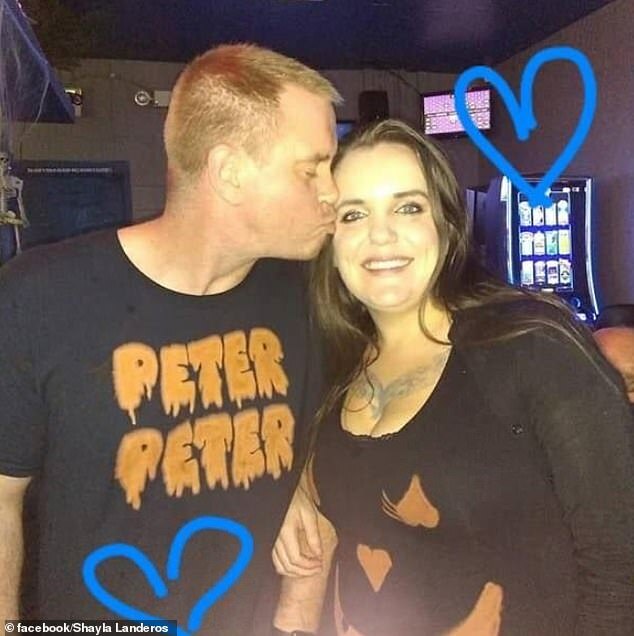 According to Perlow, Timm met with Shayla Landeros separately and looked over the paperwork. 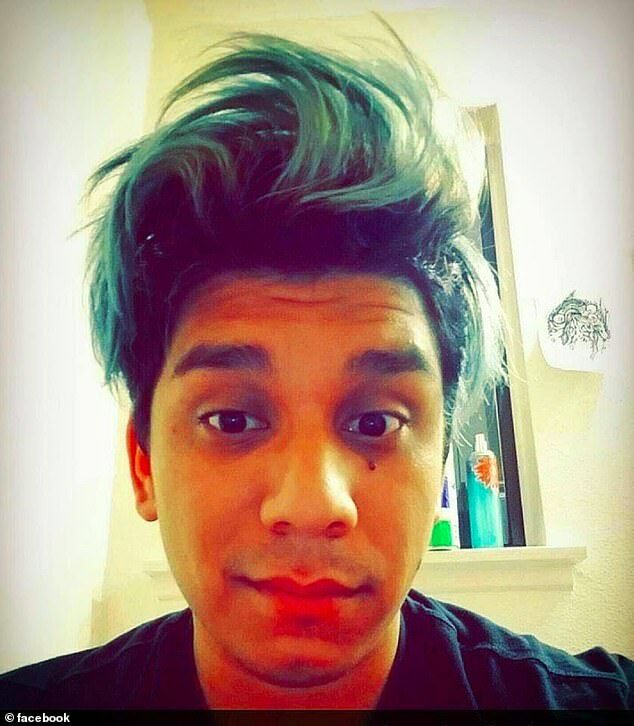 Timm then met with Charlie Landeros and told him that his ex-wife ‘had shared custody and exclusive control over where [the child] attends school,’ according to Perlow. 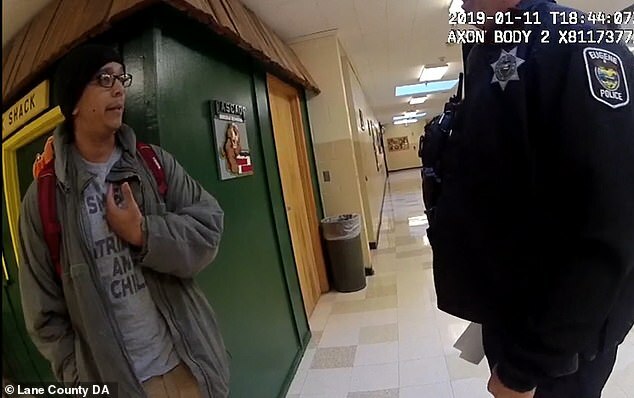 ‘The conversation was respectful between Officer Timm and Charles Landeros, though Officer Timm reported concern that there would be a problem if Landeros was present if the mother exercised her right to remove the child from the school,’ Perlow said. Charlie Landeros then left the office but stayed in the hallway to protest the officer’s order. That’s when his daughter came into the hallway ‘by coincidence,’ Perlow said. Johns, 45, and Timm, 50, are veteran police officers. Johns has been an officer since 2001, while Timm has been on the force since 2004. 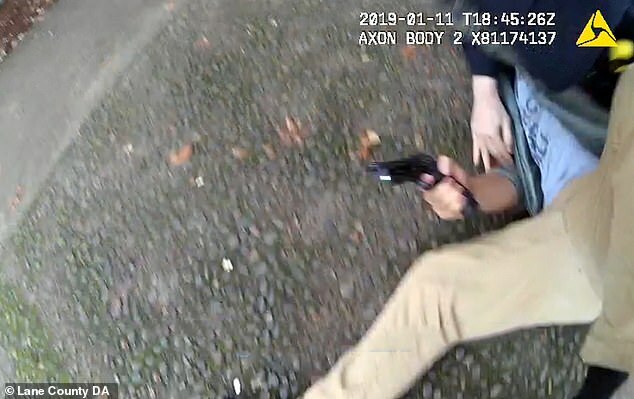 The District Attorney said that the 9mm handgun that Landeros pulled out during his scuffle with the officers was bought by a relative. Landeros was licensed to carry a concealed handgun. 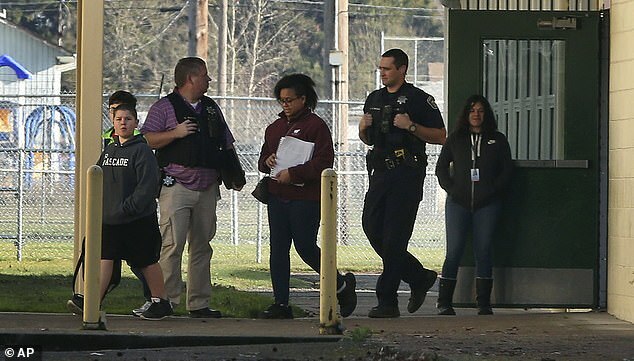 While district rules forbid bringing guns onto school grounds, anyone with a license for a concealed handgun is permitted to have a concealed weapon on campus. 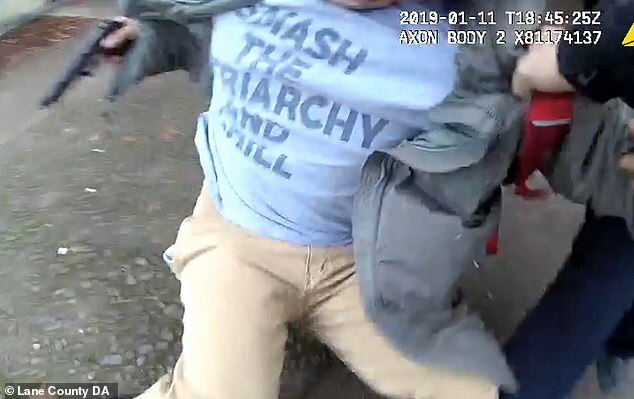 Last year, the FBI received a tip stating that Landeros was posting violent anti-government messages on social media, according to Perlow. The local FBI looked into the matter and determined there wasn’t enough evidence to indicate a crime had been committed. While police tried to track down the comment, the Facebook account was deactivated. 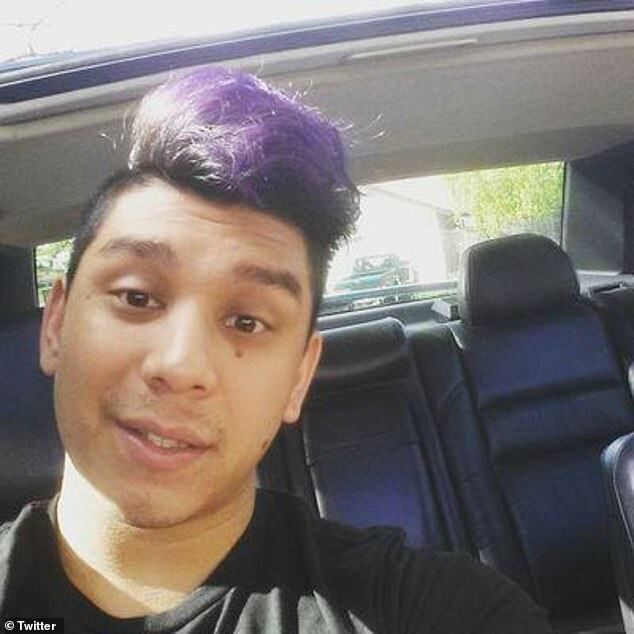 Two days prior to the shooting, Oregon police were alerted to another Facebook account with the name ‘Charlie Landeros’ that left similar comments. Landeros has been a resident of Eugene, Oregon since 1989. He graduated from Willamette High School in 2006. Landeros served six years in the Army as a helicopter mechanic and crew chief. He also did tours of duty in Iraq and Afghanistan, according to friends and family. In 2012, he received an honorable discharge and left the military. With financial assistance from the GI Bill, he enrolled at the University of Oregon, where he majored in public policy and management. 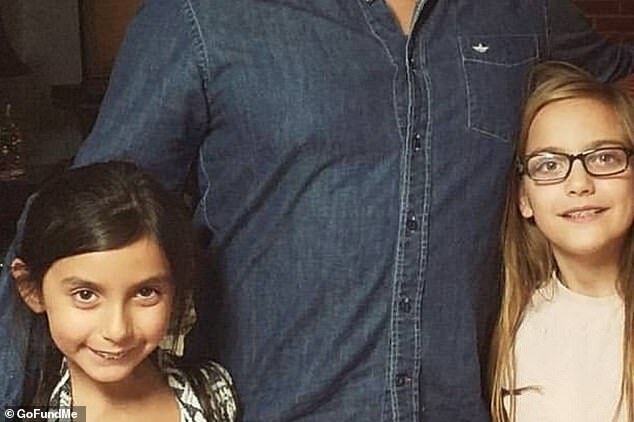 A GoFundMe page started for the Landeros family identifies Charles Landeros' two daughters as Kayanna and Natalie.